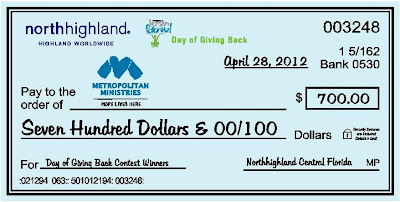 In April, I did a post on North Highlands Day of Giving Back. 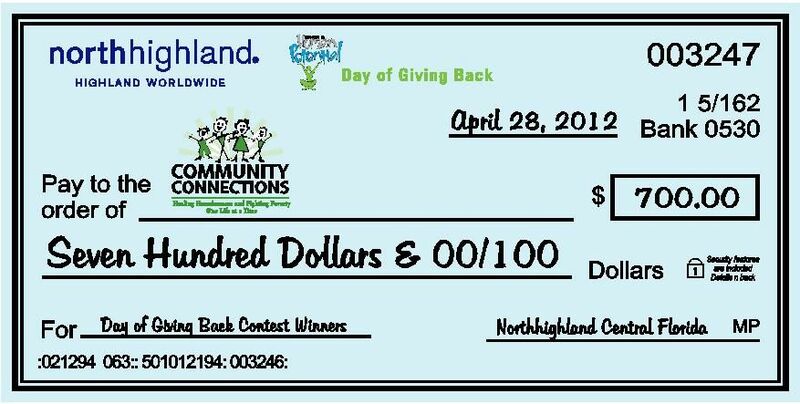 I've worked for North Highland, a global consulting firm since March 2011. The Day of Giving back took place on April 28th and 31 offices across the world got together to Invest in Human Potential by giving back to the communities they live and work. As I mentioned in my post, I was in charge of coordinating the three Central Florida North Highland offices, Tampa, Orlando and Jacksonville. 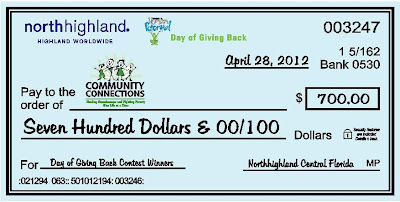 On one of the coordinator calls prior to the Day of Giving Back, North Highland announced a contest: one office would be awarded $2,000 to give to their charity. The winning office would be decided by a variety of things including: highest office participation; social media activity; charitable donations. 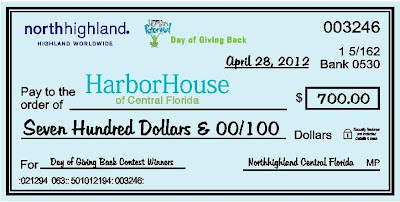 This was great timing for Metropolitan Ministries, who is currently doing a match campaign, so our $700 donation for the Tampa office will technically be $1,400! 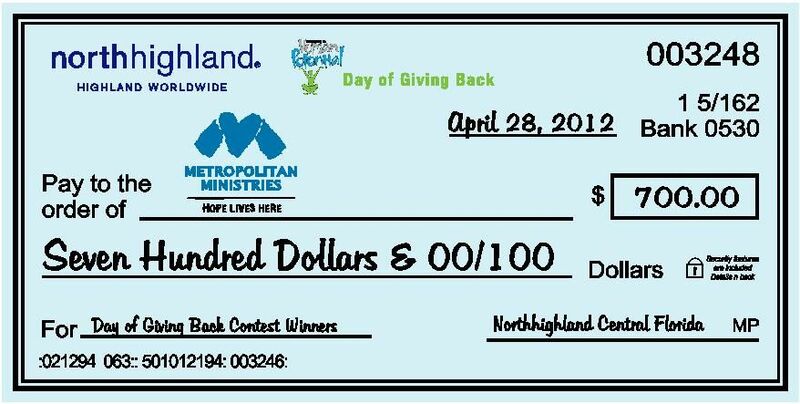 Here is the email with some of the amazing things North Highland did in their communities worldwide. It's no wonder that we have been named by Consulting Magazine as the Best Firms to Work For, five years consecutively as #4 or higher and named the 2011 #1 large company to work for in Florida by Florida Trend Magazine - stay tuned to hear if we took the title for 2012! With a total of 31 offices, and over 1,200 employees, clients, family and friends, we were able to make an impact in our communities globally. • Donated over $2,300 in food, collected over 200 pounds of food, and donated over $1,000 in toiletries, gift cards, and energy efficient light bulbs. • Planted 180 new willow branches, and beautified parks by spreading pounds of mulch and planting trees. • The Los Angeles and Atlanta offices for being creative and capturing their day of giving back with a video. Job well done! • The Facebook photo collage created by Megan Wood (hey that's me!) that received 100+ likes! • All the local office coordinators, on-site event coordinators and photographers for all your hard work. Now on to the contest. The office that met and exceeded all of the contest qualifications is the Central Florida office. • Central Florida had 143% participation! • Their charities also posted the photo collages and photos on their Facebook pages as well! The office’s results across all of the contest criteria made them the winner of the contest! 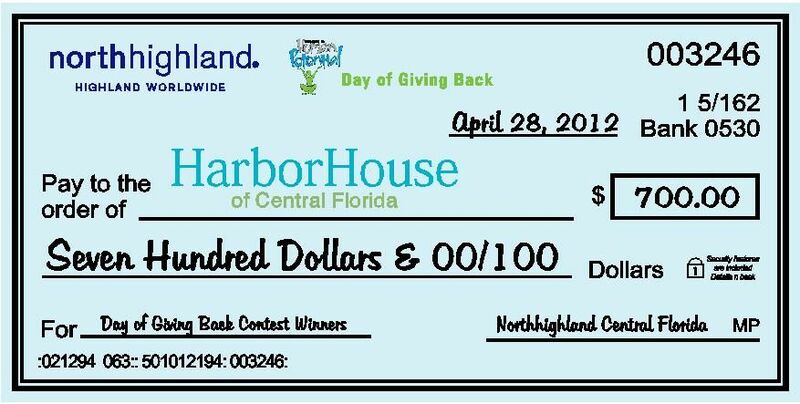 The Central Florida office will be awarded $2,000 towards their charities! Congratulations! I can see why our company was named one of the best firms to work for! I am sure all three charities are so happy for the funds and for all the work you guys did. Warmed my heart to read your article. It is nice to read what people are "doing", not just what they aren't doing.